The epic solo flight made by aviator Amy Johnson from the UK to Australia is being retraced. Bi-plane pilot Tracey Curtis-Taylor is following a similar route to the aviator who became the first woman to make the journey in 1930. Ms Curtis-Taylor, 55, described the 13,000-mile flight as a "destiny which was always meant to be". She took off from Farnborough, Hampshire, in The Spirit of Artemis, shortly before 13:00 BST. 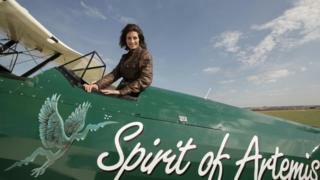 The journey will see her fly across 23 countries, making 50 refuelling stops in the 73-year-old open cockpit bi-plane. Unlike Amy Johnson, her flight path which sees her fly below 1,000ft (304m) is affected by the conflict in the Middle East. "Amy just drew a straight line to Australia - she flew right through Syria and Iraq but I can't go that route for obvious reasons," Ms Curtis-Taylor said. The flight is expected to take 12 -14 weeks with her arrival in Sydney planned for early 2016. Amy Johnson's solo flight to Darwin took 19.5 days. In 2013, Ms Curtis-Taylor flew 8,000-miles solo from Cape Town to Goodwood, West Sussex, to recreate the 1928 flight of Lady Mary Heath.